Not checking your blind spot could cost you your life. The blind spot is a real-life concept which can change in a split second. What wasn’t there a second ago, could show up when you least expect it. This could work for or against you creating a false sense of security as your life may appear to be going in the direction you wish. You may not see any worries or known concerns, yet something could show up and decrease your happiness, health and productivity when you weren’t checking your blind spot. 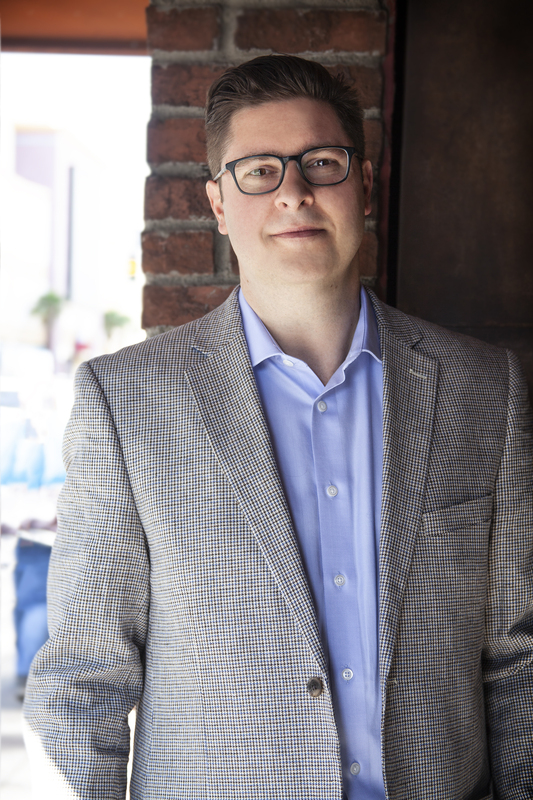 Over the past 2 decades, Kyle Ferroly, PhDc, has been gathering data, insight and clinical experience in the areas of Neuroscience, Physiology and Psychology. 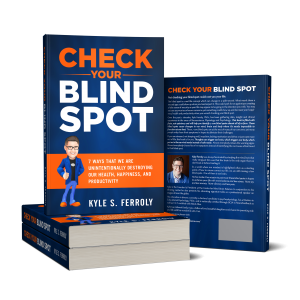 This book is filled with facts, not opinions, and will help you identify 7 core blind spots almost all of us face. These blind spots cause changes in our mind, brain and body where it’s nearly impossible to function at our best. These 7 core blind spots are at the root of many of our concerns, yet many people only chase their symptoms in hopes to alleviate their challenges. If you are stressed, not sleeping well, impulsive, lacking motivation and drive, or just want more out of life, this book is for you. Thoughts can trigger our brain, which triggers our body, which put us in the survival mode instead of safe mode. Almost everybody misses the warning signs. Almost everybody chases his or her symptoms instead of identifying the root cause often found in that blind spot. Kyle Ferroly was always fascinated by studying the mind, but what really intrigued him was that the brain is the only organ that we don’t look at before treating it. In a world where our mindset is highlighted often as a starting point of how to course correct our life, we are still missing a few blind spots. One of them is our brain. 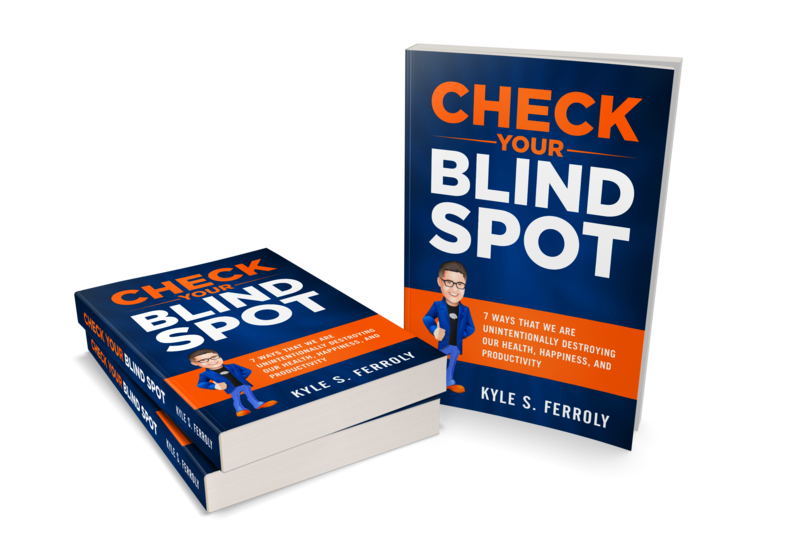 He has made it his mission to point out these blind spots in hopes to enhance your life with more balance and less stress. More joy and less anxiety. More vibrancy and less pain. Kyle is the Founder & President at The Center for Mind Brain Balance. In conjunction to his thriving center he also presents his educating signature talks as a professional speaker on stages all over the globe. His education is diverse, currently, a doctoral candidate in psychophysiology, has a Masters in Educational Psychology, PhDc, and is nationally certified through BCIA in Neurofeedback as well as C.E.T certified with Mind Alive. Kyle is a midwest family man, a father of two beautiful daughters and shares his parenting role and life with his wonderful wife, Cari.